The AF-ATC is the ideal ergonomic and space saving desk monitor mount for corporate or home offices. This beautifully designed and engineered mount delivers exceptional functionality including focal distance, display height settings, and viewing angle fine-tuning. 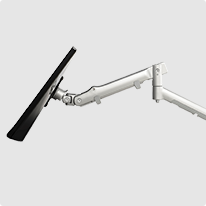 Optional 360° rotation makes sharing your screen simple, and ball bearing arm joints ensure supple, long-life operation. 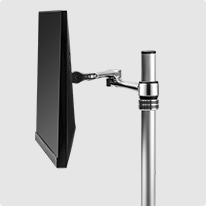 Quick release/attachment display mechanism makes installation and swapping monitors a one-person operation and cables are cleverly managed for a clean and professional look. Monitor weight suspension up to 8kg. Is this mount compatible with my screen? Explore our products to find mount that fits your screen. Enter VESA mounting hole pattern & weight of your screen (without stand) Need help? Display weight and VESA mounting hole pattern are the two key specifications that you need to know to find a suitable display mount. 1. 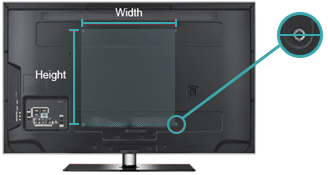 Identify the VESA hole pattern by measuring the distance between the mounting holes on the back of your screen in terms of width and height.Measure from the centre of each mounting hole as shown below. Please note that in very rare cases some screens don’t have any mounting holes. This means that only the supplied factory fitted stand can be used for the display. 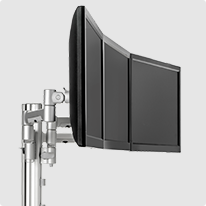 Curved screens: the weight capacity of Atdec mounts is based on regular, flat-screen displays with the VESA fixing located near the midpoint. Curved displays, deep devices (such as all-in-one PCs) and offset VESA locations exert additional leverage on the mount. This extra load can cause the capacity of the mount to be exceeded, even though the weight may be within the stated range. Please contact Atdec if you would like further information.